Do your children love playing apps on a cellphone or tablet? My 6 and 8 year old do, especially during car rides. So I am always on the search for quality, educational apps. One app that they really enjoy playing on is called Agnitus! 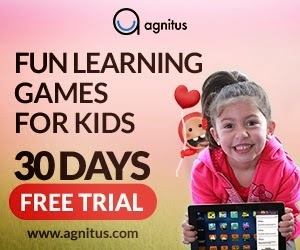 Agnitus is a Tablet (iPad, Android, Kindle) app that has over 50 educational games geared towards children ages 2-8 years old. The app features a comprehensive curriculum so there is no need to worry about what they are learning. Some of the topics covered include memory skills, colors, basic math, reading, sounding out consonants, spacial relations, etc. One of the really cool things though about this app that makes it different from others is that you can get reports about your child's progress so you will know exactly what they are learning and completing. You can even access the reports directly from the app! You can also select specific skills for your child to focus on! Agnitus is always adding new content to their app as well. Recently they just announced the launch of their Interactive Books! You can download the app for free from all app stores which provides you with limited game access. However, if you visit the Agnitus website to sign up you can get a FREE 30 day trial!!!!! If your children love Agnitus a subscription is just $6.99 a month and you can cancel at anytime. Agnitus currently has a giveaway for an iPad and (3) 3 year subscriptions on their Facebook page right now, so be sure to enter that as well.